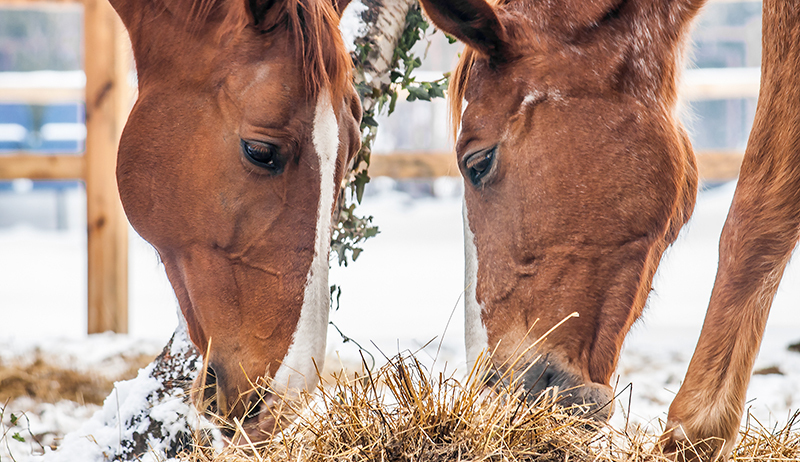 The winter months are tough on your horse, so make some changes to their feed to help them cope. As winter approaches, it’s important to review our horse’s nutrition and make sure they’re well prepared to deal with the coming colder months. How do you know if you need to make changes to your horse’s diet in preparation for winter? Often we ride our horses more during the summer months than we do during the winter months. Additionally, the type of work our horses do during summer can be very different than the work they do during the winter. Both of these are reasons your horse would need a diet change. If your horse is going to be getting the winter months off, or is going to be doing less rigorous work, it’s important to adjust the energy (calories) in their diet. This can be a simple change, such as decreasing how many pounds of concentrate he gets. Always follow label recommendations for workload. 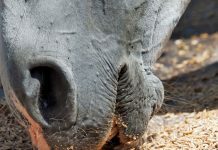 Your horse should always have plenty of forage, but you might look into something less rich in calories for the winter, such as switching from alfalfa hay to timothy. If you have a horse that struggles to maintain good weight in weather that’s not stressful, it’s going to be even more important to prepare for winter. This could be due to breed, age, or existing health issues. I recommend beginning diet changes as soon as the weather starts to cool down. It’s difficult to bring a horse back up to the right weight after he’s lost it. It’s much easier to make gradual changes as needed and slightly over condition instead. 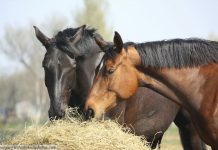 Feeding these types of horses plenty of high-quality hay in addition to an appropriate concentrate and/or supplementary fat (such as vegetable oil) works well for maintaining or increasing body condition. Paired with proper blanketing, making these nutritional changes should help your horse stay in good weight all winter long. Horses are very adaptable, but dealing with weather that’s more severe than they are used to can be stressful. These horses may need a short period of increased calorie intake as winter begins. Once they are accustomed to the weather, it can be fine to adjust their diet back. 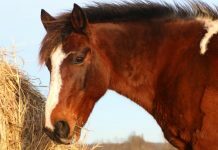 Good quality hay is usually the best choice for most horses. Yes, even if we don’t have really super cold winters, they still need to adjust to different hay and grasses.